A snapshot of the revised and updated Florian's Photos homepage (it will look different when you visit - it is constantly changing). This is only a short administrative update. While we were on holiday, SmugMug, my photo hosting service, released a completely updated interface. For a while, I feared the thought of moving my site and tried to ignore the changes altogether. However, eventually my curiosity won and I started a hesitant first look at the new SmugMug (an excellent preview mode allows redesigning the new site while the old design remains visible to the world). Soon, I could not stop tweaking the layout and experimenting with the plethora of customization options. 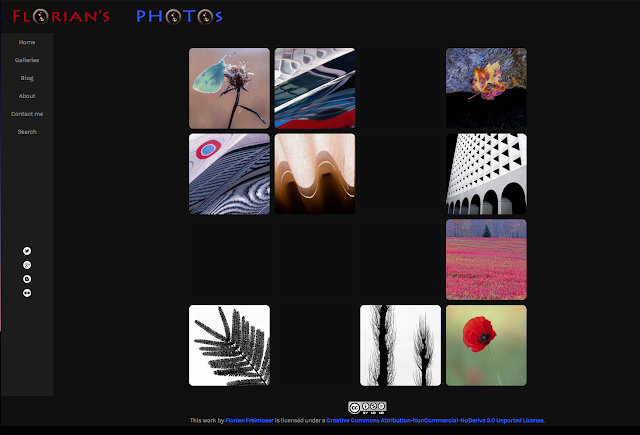 Since last week I have spent countless hours migrating and redesigning Florian's Photos on the new SmugMug site. I have just pressed the "UNVEIL NEW SMUGMUG" button, confirmed and reconfirmed my intention to unveil the site, and now there is no way back. I hope that you like the revamped site (I am particularly satisfied with my new homepage) and that all "old" links still work (as promised by SmugMug). If they do not and you spot a defect link or a missing photograph, please let me know via the contact form (which is also much better integrated on the new site). So far, my experience with the new SmugMug has been very positive, although it took me a while to figure out how to navigate and use the new system. The customization options are greatly extended and the whole system is built more hierarchically and therefore logically. It is now much easier to change the layout of the entire sites, a sub-category of sites or only one webpage, and a professional-looking site is achieved with less time, effort, and complicated customization (although a few lines of CSS code were still required here and there).